Summit Club of Flower Mound is with Paul Stone and 7 others. Summit Club of Flower Mound added 11 new photos — with Don McDaniel. Summit Club of Flower Mound is at Enzos NY Pizzeria. Summit Club of Flower Mound is at Circle R Ranch. 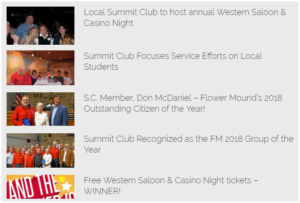 Thank you to all those that attended, supported, and worked The Summit Club 2019 Western Saloon & Casino Night. It was a great event this year that raised a bunch of money that will go to support the men and women of our Flower Mound Police Association and the Flower Mound Professional Firefighters Association as well as other local non-profits.